Labor Day SALE at BatterySharks! It’s the first Monday of September! It is time to celebrate Labor day – a tribute to the contributions workers have made to the prosperity of our great nation! 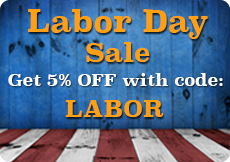 We would like to offer you a special 5% discount by using the coupon code LABOR. The coupon code can be used when you order products from all categories except X-treme Scooters. The offer is valid for all orders placed by 3rd of September 2014.